The lush and soft yeast cakes, pies and especially the pancakes out of sour dough. It is based on milk products: kefir, yogurt, whey, sour cream, diluted with water, or just sour milk. If you have sour milk, do not worry. Need just a few extra ingredients to get the mountain vkusnyuschie thick and puffy pancakes or baking soft melting in your mouth pies. Dry yeast are measured by one packet (11 g) equivalent to half of a pack (50g) fresh. Pancakes and pies, you can prepare the yeast dough. The dough is mixed without eggs and oil, and allowed to stand for twelve hours. It fits several times, precipitated and becomes more acidic. For pancake batter liquid. For pancakes – thicker. If no dough, you knead the dough immediately. First, dissolve the yeast in a little warm sweet water and fit. Then whipped eggs, poured back room temperature sour milk, osypaetsya salt, flour, all whipped in, add the yeast and vegetable oil (about 60 grams). The dough will be a little bit thick. When it came, to pour boiling water into it and mix well (precipitate). Then let it rise and repeat the operation. Now you can bake pancakes, brushing the pan with oil. For pies of dough on sour milk is also better to prepare the dough. But you can use a quick method. If the dough is lean, you can do vegetable oil (120 g). If butter is added to it 300 g butter (margarine). The dough is made as for pancakes – for the night. 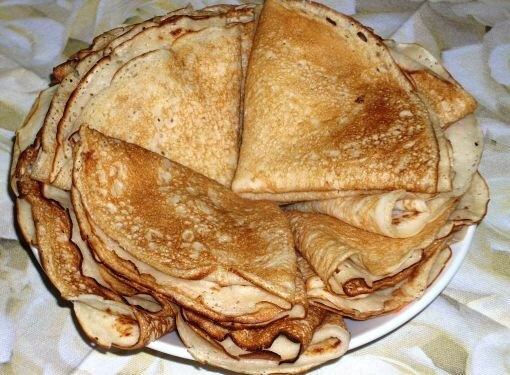 Straight dough method – the same as for pancakes just the batter is much thicker. The dough should be allowed to come once. During this time, prepare the filling. Then sculpt cakes, wait until they will fit on the baking sheet, and bake in the oven or fry in oil. The baking pan before putting on the patties, should be lubricated with oil or margarine. The finished pies can be lubricated with melted butter so that they become softer, thicker and longer callous. – jam or dried fruit. If cakes prepared with sweet filling (jam, dried fruit) the dough is placed a double portion of sugar.